A spacious dining hall with seating capacity of around 120 students at a time. 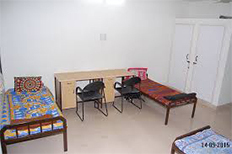 The hostel has a total capacity of 32 rooms which accommodates 4 members. Out of 32 rooms, 12 are attached. There is one common prayer space, recreation space and one office room in ground floor. There are study areas in each floor. To involve in group studies, the students can make use of the study hall. Quality purified water is provided to the students using water purifier. Wi Fi connectivity is available in the hostel. The hostel is equipped with an inverter of 3KVA to provide students with an uninterrupted power supply . 24 hours security service is provided for the hostel. The students can relax themselves by involving in indoor or outdoor games during their leisure time. For relaxation and news gathering, the students can make use of Television which is available within the Mess hall.